In the sebaceous zone, the epithelium consists of a basal layer of deeply stainable, flattened cells with rounded nuclei. In the layers above, the cells increase in size, become polyhedral in shape and get filled with droplets of lipoid material which makes them less stainable. The nuclei become pyknotic and finally degenerate completely . The cells break down and release their secretion into the lumen of the tubules. On the micrograph above, this secretion completely fills up the lumen. 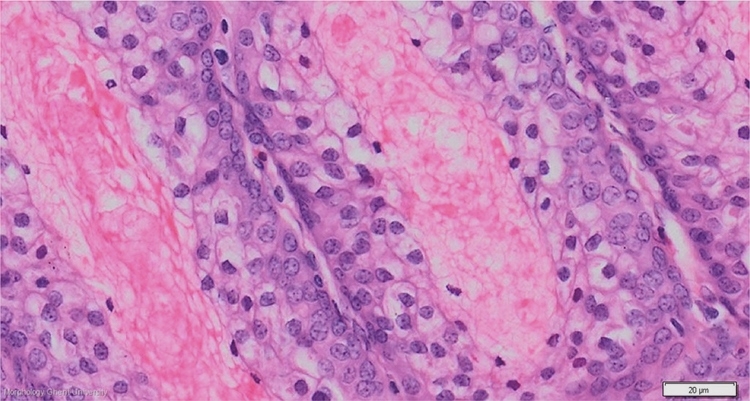 In the sebaceous zone, there is very scarce connective tissue in between the glandular tubules.